The Irish Memorial is about the dedication to the memory of more than one million innocent men, women and children who perished during the years 1845 to 1850 and to the millions of Irish immigrants who found here in the United States of America the freedom, liberty and prosperity denied to their ancestors in Ireland. This Memorial, a national monument, was opened to the public on October 25, 2003. The Memorial stands prominently at the southeast corner of Front and Chestnut Streets in Philadelphia. 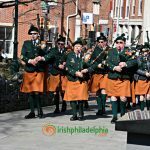 To mark the sesquicentennial of The Irish Starvation, civic leaders, government, private foundations and the community at large worked together on a $3 million project to plan and construct The Irish Memorial Monument at a park setting at Front and Chestnut Streets in Philadelphia, Pennsylvania. Co-chairs are Governor of Pennsylvania, Edward G. Rendell and Reverend Nicholas S. Rashford, S.J., former President of Saint Joseph’s University, Philadelphia. The centerpiece of this project is a monumental bronze sculpture set in a 1.75 acre dedicated park. 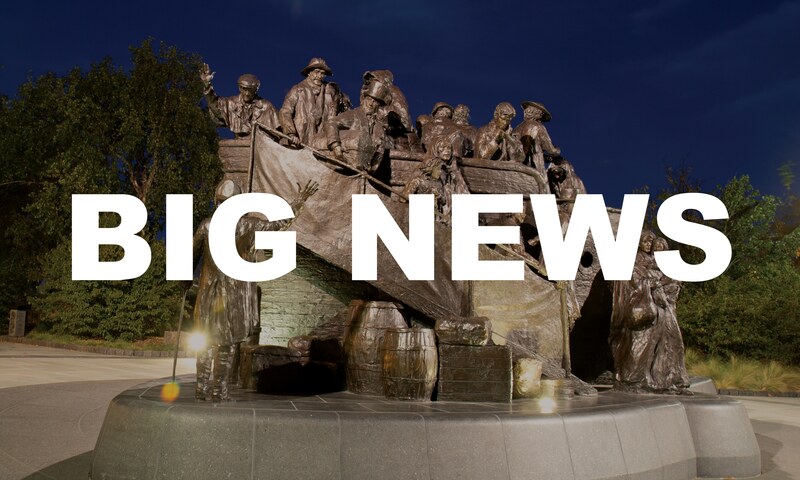 Glenna Goodacre, the artist who sculpted the Vietnam Women’s Memorial in Washington, D.C., created the monument, including 35 life-sized figures. The bronze work measures a spectacular 30 feet long by 12 feet wide and 12 feet high. 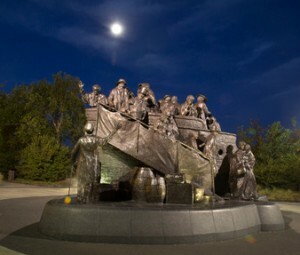 The memorial depicts the cruel starvation which claimed one million Irish lives between 1845 to 1850; the harrowing journey to America taken by a million more; and the indomitable spirit of those who arrived safely and resolved to face the challenges of life in a new world. 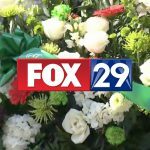 The Irish Memorial adds to the cultural and historical richness of Philadelphia’s Historic District at nearby Independence National Historical Park and Penn’s Landing. Though it has special meaning for the 44 million Americans of Irish descent, it touches everyone who approaches it, regardless of their ancestry. Besides presenting an important chapter in history in a moving and effective way, the memorial is a significant addition to Philadelphia’s great collection of public art, and one of the few pieces created by a major female artist. It serves as both a national attraction and a place for peaceful contemplation.